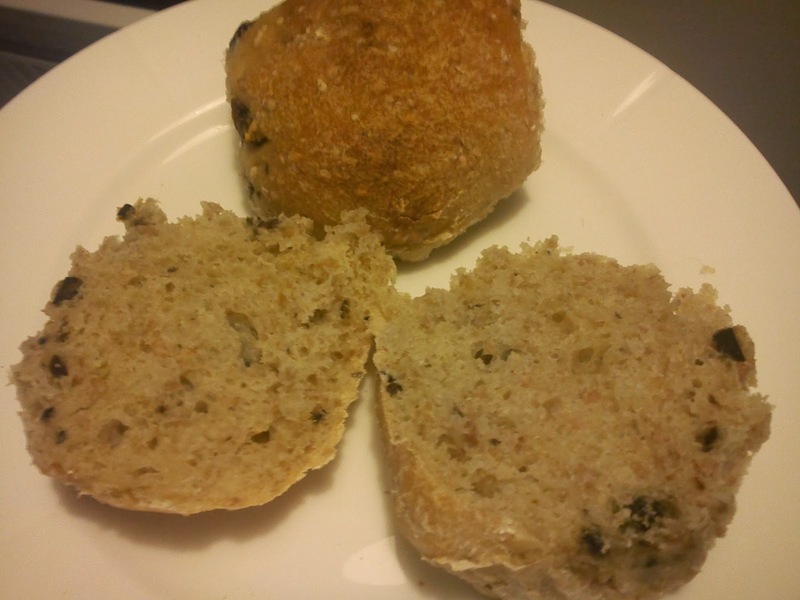 I have been making a twist to this recipe on Three wheat buns by using roasted halzel nuts and only using one type of flour instead of two (plain & whole grain). The addition of the roasted is giving an interesting flavour twist being both nutty and sweet. 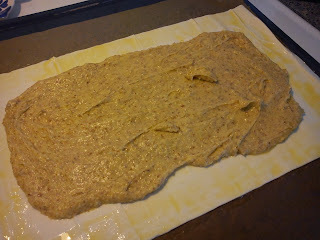 However, I need to reduce the water content another tinme, as the dough was relative wet. Due to a more wet dough I placed the bun dough in some paper muffin forms to keep their shape. This was not a brilliant idea of mine I have to admit here. The bottom of the bun is sticking to the muffin form, as I have to cut the lower part of the bun with knife, so I do not eat a combination of bun and paper !!!! As second step you should roast the hazelnuts at 200'C for 8-10 minutes in the upper part of the oven (conventional). Cool down the hazelnuts, before you remove their skin (I used kitchen towel for this purpose) folloed by chopping roughly. Add in the soaked cracked wheat grains and knead for another 10 minutes on the mixer. Bake the buns at 225'C for 25-30 minutes in the middle part of the oven. As you perhaps already know, I am BIG fan of risotto, so therefore I am sharing yet another risotto with you, which I have cooked using a recipe found in the weekly newsletter from Årstiderne, issue 42/2013. In hindsight this risotto recipe would do perfect with using some white wine and butter as well to bring both freshness and creaminess to the final risotto. Heat up the olive oil in a bigger cooking pot. Add in the chopped onions and fry them until they are clear in appearance. 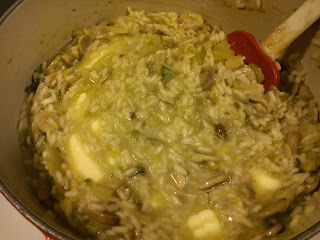 Add the risotto rice into the cooking pot and fry them for 1-2 minutes and stir them around for 1 minute to absorb the oil. Add in the various spices together with some part of the water. Continue to add in the warm water little by little, let the rice absorb most of the liquid, before adding more water. This part of the cooking process takes approx. 20 minutes. Keep stirring regular. While the cooking process fry the Portobello mushrooms on a pan together with the spring onions. Mix the risotto together with the fried Portobello mushrooms and spring onions. Also stir in the majority of the grated Parmesan cheese. Enjoy together with a chilled glass of white wine. 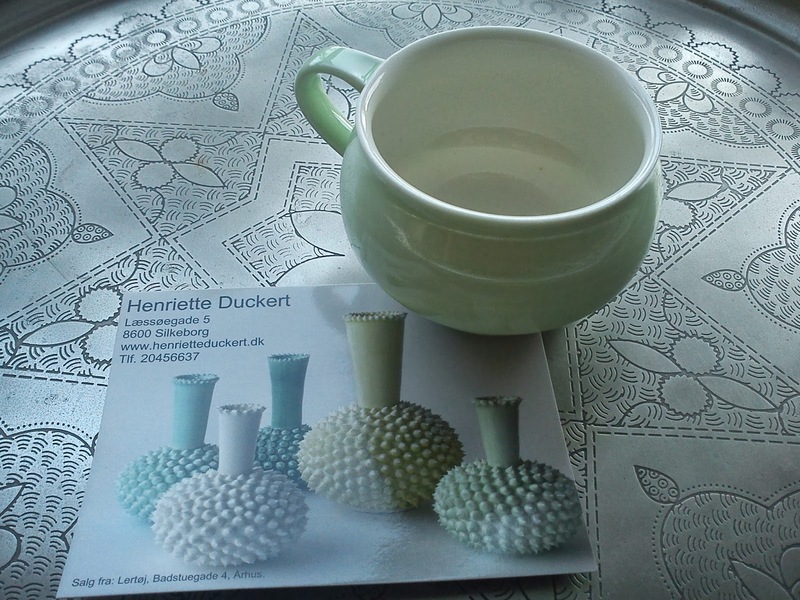 The Tea Time Treat for this first month of 2014 is hosted for the very first time by Jane fromThe Hedge Combers, and she has selected the theme of EGGs. I have been very much in doubt, what I should make for this month´s virtual tea time table having egg inside !!!! Should it be a citrus curd of some kind or a muffin or citrus cake thing or .... ??? After some serious thinking I decided, that I would make a sorbet !!! I can more or less see you on the other side of the screen thinking, what does sorbet have in common with EGG !!! Well, in order to get whipability in a sorbet you need protein, and as a sorbet does not contain any dairy ingredients, which can provide such protein, the trick is to use egg white as protein source. I have been getting this advise from some good work colleagues, which are to be counted among the world leading experts within ice cream. Where is my part of the sorbet ? 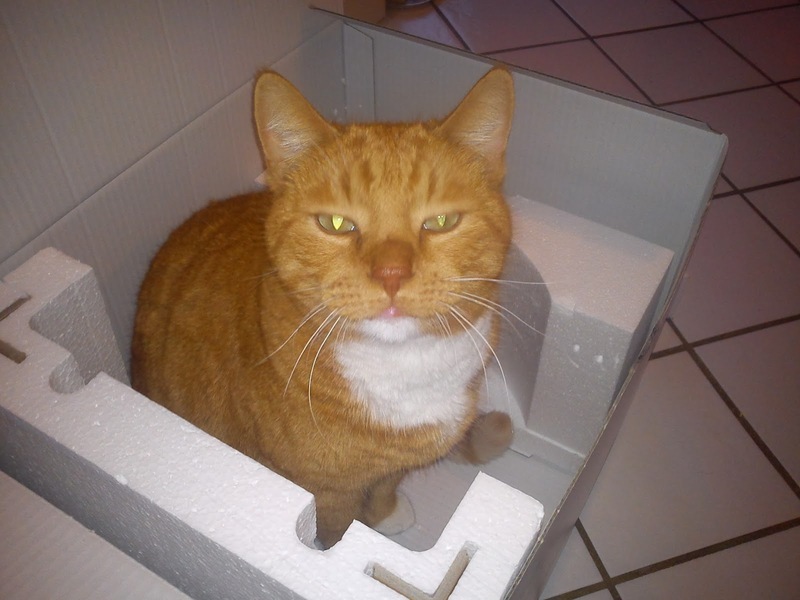 While I was freezing the pear sorbet, my garden lion Hannibal found a free space for him to occupy in the box, where the ice cream machine normally has it´s home, when it is not busy freezing ice cream. Boil the pear pieces and 100 g water together, until the pear pieces have cooked out. Blend the entire pear mass together. Add lemon juice and lemon zest into the pear mass. Cook up pear mass together with the rest pf the water and all of the sugar. Cold down this pear mix for min 4 hours or night over in the refrigerator. Whip the egg white into foam. Stir the pear mass and whipped egg white gentle together, before it in the ice cream machine. Run the pear mix on the ice cream machine for 30 minutes. Place the pear sorbet in the freezer. Another way of serving leftovers of risotto instead of the usual reheating in the microwave oven, is to divide a green/yellow/red pepper fruit into two halves and remove it's seeds. 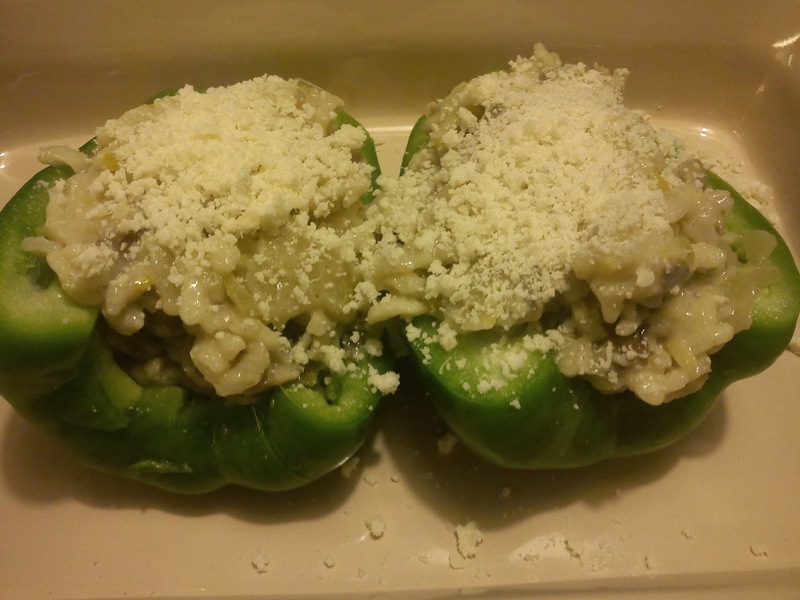 Afterwards you fill up the pepper fruit with the leftover risotto, sprinkle it with Parmesan cheese. Place the pepper fruit in a oven stable baking tray, place it in the middle part of the oven at 200'C for approx 30 minutes, until the pepper fruit is warm and soft. I have found this idea in the magazine "Isabellas", issue 08/12. Quiet some years ago I went to the island of Læsø in order to have a rowing tour. Out of our 3 days set aside from rowing, we were only able to row one day due to some very strong wind. So we went sight seeing on the island, where we went to a place selling wool at Læsø Uldstue. 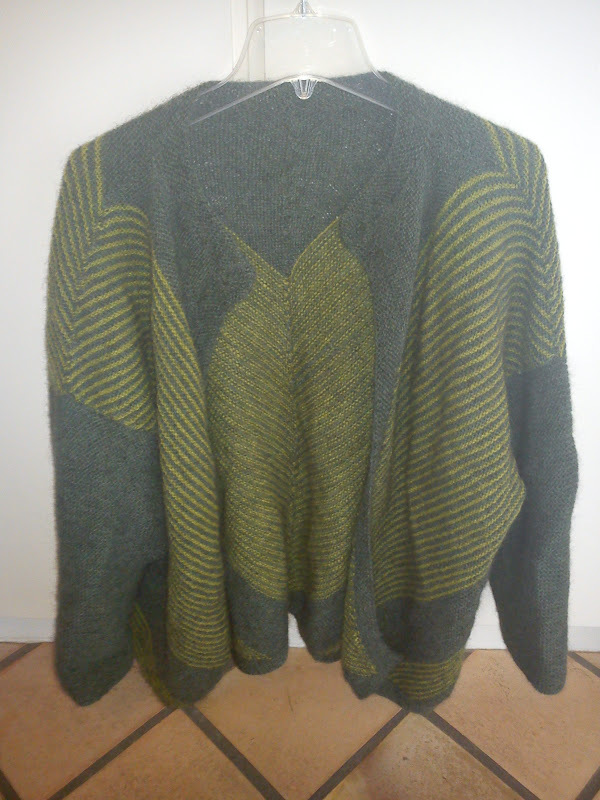 Here I brought some thin wool for a jacket called Skovbojakken. 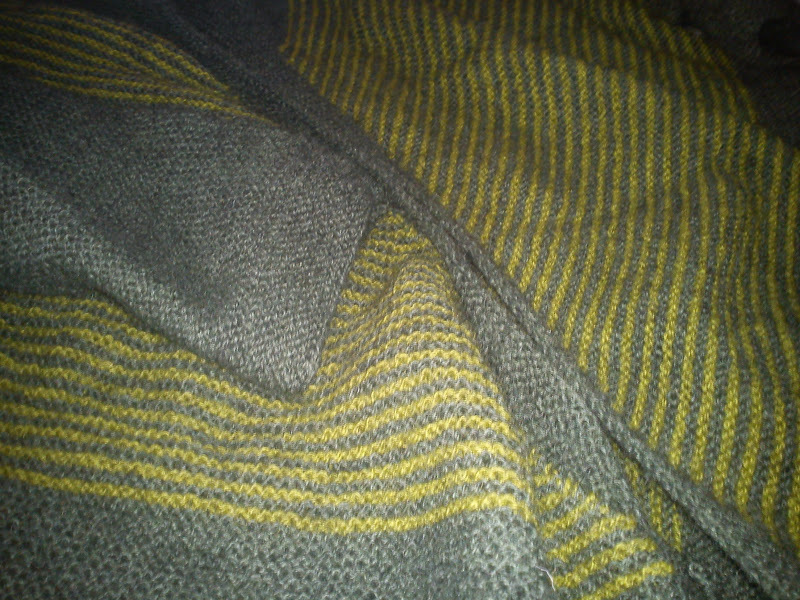 It took me some years to finish off the jackets, as it quiet a big task to knit the border around the entire jacket. Anyway I would like to share some picture of the final result with you. 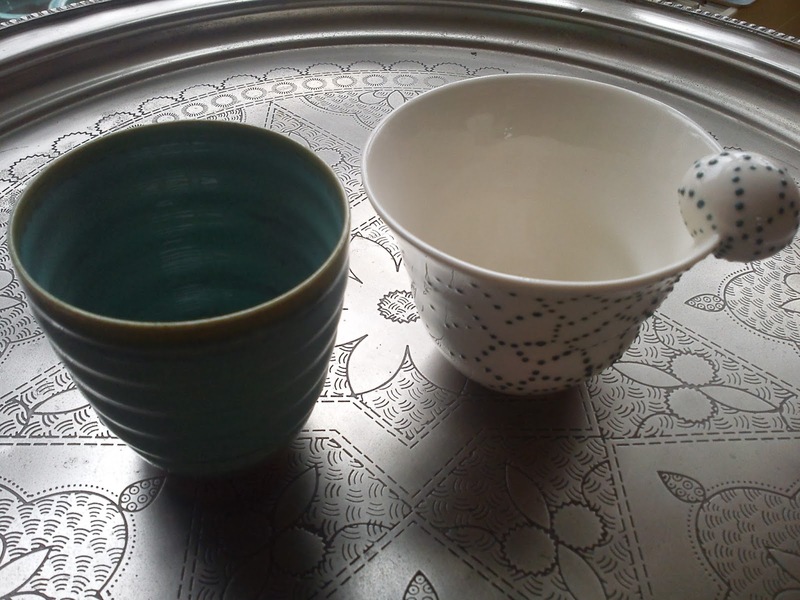 It is very classic design, which you can use for many years to come. I have located this recipe on pasta with watercress pesto and buffalo mozzarella in Femina issue 01/2013, and it is Louisa Lorang, who has developed this recipe. I am fan of all her many creative food and cocktail recipes, which I like to test in my kitchen and afterwards to share with you. I have made no modifications at all to this recipe. It a very easy recipe to make, so you can make a home-cooked meal in no time, in something like 10-15 minutes. Cut or pluck the watercress roughly. Blend the watercress, pine kernels, garlic, Parmesan cheese, olive oil, lemon juice together. 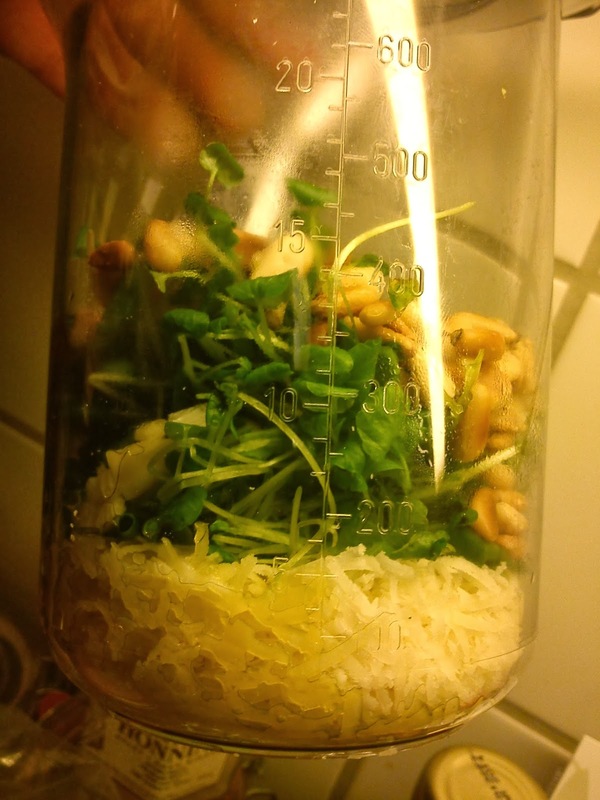 Adjust the taste of the watercress pesto with salt. Drain the water from the pasta. 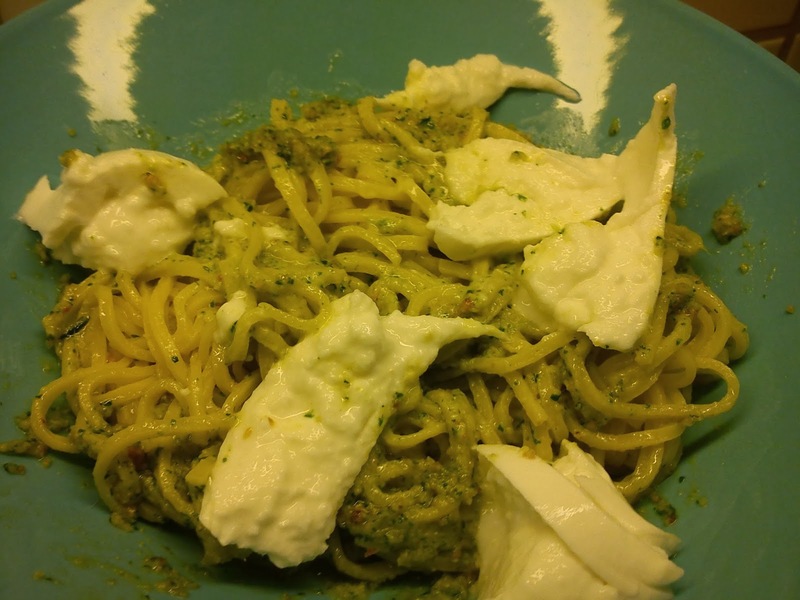 Stir the watercress pesto into the warm pasta. Divide he buffalo mozzarella into larger chunks and add them up on of the pasta. 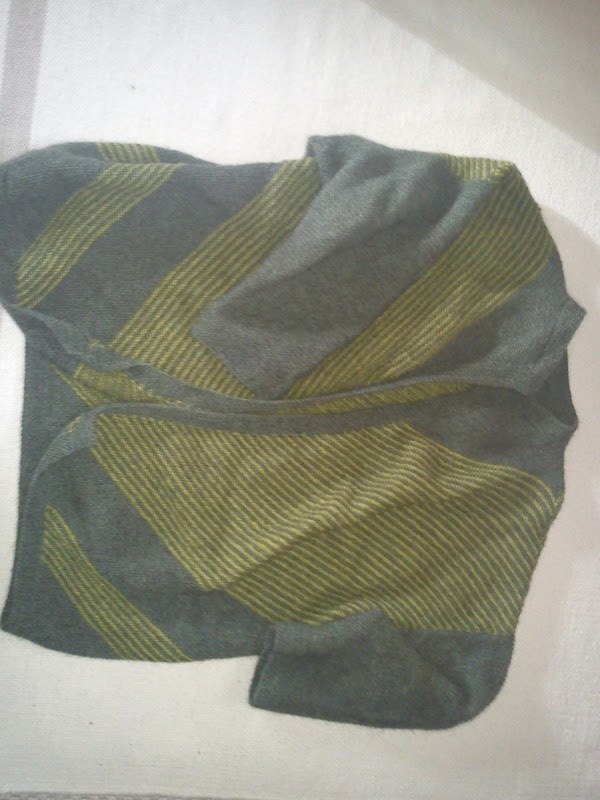 It is one week ago, that I started turning this yarn for knitted plaid into a knitted plaid. And as the pattern is so simple (moss stitch) I am able to knit, when I sitting in front of the TV seeing the news or a new episode of TV series/show like the Danish version of X Factor or Arvingerne. 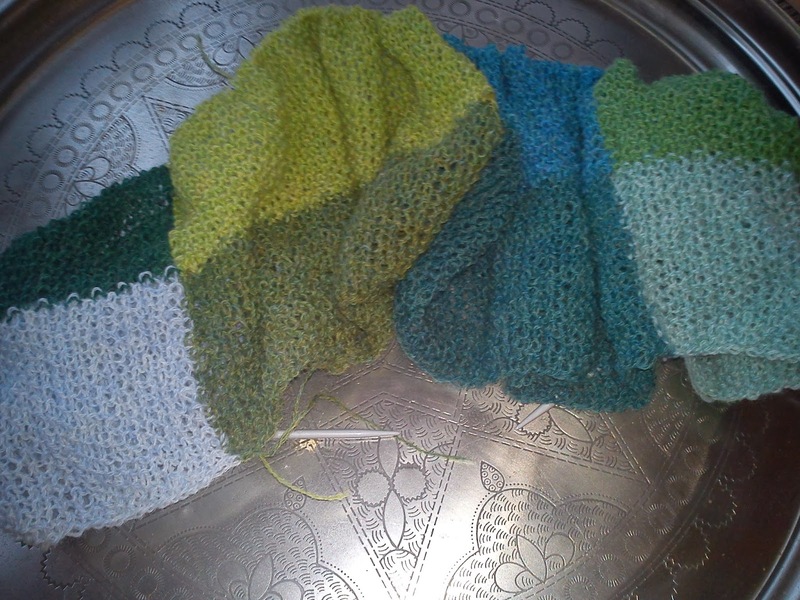 And as you can see, that I have so fare been knitting two colour rows of a total of 17 colour rows, so I still have a long way in front of me. Hannibal the Cat has been behaving himself, so fare only attacking the balls of yarn on a few occasions, if they suddenly started to roll across the floor in the living room. 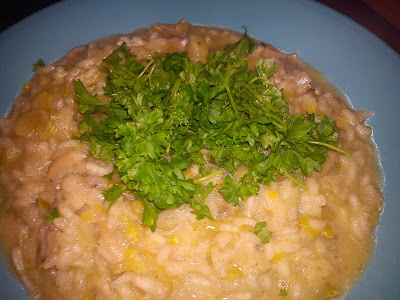 I am huge fan of risotto, both home-made as well as when I am out eating on restaurants. The creamy cooked rich, flavourful ingredients and plenty of butter/cream is comfort of first class in my opinion. Yes, you can spend quiet some time on dicing and slicing all the various ingredients followed by the time, when you are stirring the risotto during the cooking process. 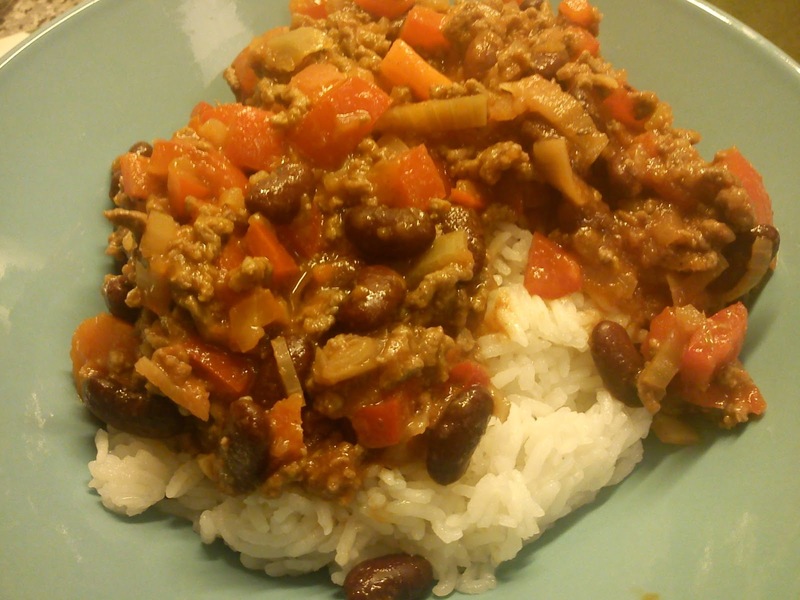 But when you can relax, and you can easily make a big portion, so you have some leftovers for the freezer for those evenings, when quickly prepared food in huge demand. And you add in the butter into the warm risotto mass, the most wonderful buttery flavour is swirling around you in the kitchen. If you make a bigger portion it is important, that you first added the parsley on the part of risotto, which you will be eating that particular day, as fresh parsley can contain earth bacteria, which is unwanted in food, which will be cooled down and reheated later on. 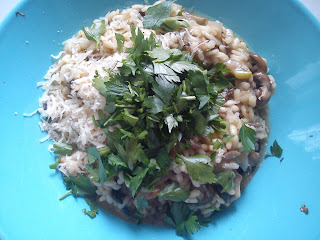 I found the original recipe on this risotto in the magazine called "Isabellas", issue 08/2012 making some modifications on the amount of added vegetable stock (decreasing) and increasing the amount of mushrooms. The extra amount of mushroom is giving watery to the dish as well, so less vegetable stock is needed for the cooking process. Afterwards add the warm vegetable stock little by little, let the rice absorb most of the liquid, before adding more vegetable stock. This part of the cooking process takes approx. 20 minutes. Keep stirring regular. When I located this recipe on kylling tikka masala med æbler on the home-page on "Sæson for god smag", I knew at once, that I needed to make this specific dish as it involved the use of apples. I still have plenty of apples from my very family apple tree in my little park, when though I am doing my best eating an apple a day (in order to keep the doctor away). 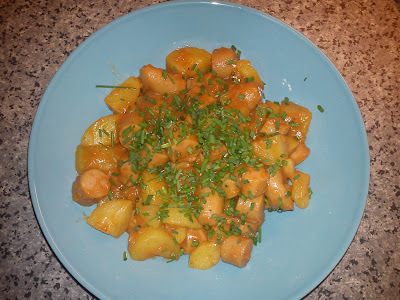 And at the same time making this dish meant, that I could make extra portions for those weekday evenings, where the cooking needs to as easy as possible. Heat up the olive oil in a large cooking pot. Fry the onion, chili and chicken. Afterwards add in the garlic, tikka masala paste, pepper fruit and chopped tomatoes. Let everything simmer under lid for 5 minutes. Add in the apple boats and let everything simmer for another 5 minutes under lid. Serve the chicken tikka masala with rice, mint leave, Greek yogurt and flat bread. Do you have any idea, what I am going to use these 11 different balls of yarn for ? Well, noticing the headline of this blogpost, you should have a pretty good idea !!! 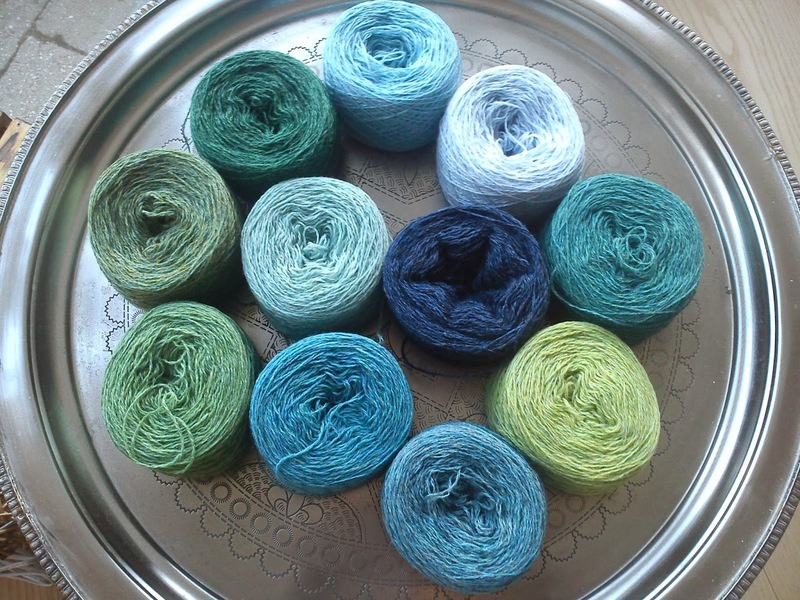 Yes, it is correct I will be knitting these 11 different balls of thin wool yarn into a knitted plaid using a kitting pattern by Sys Fredens from her book "Puder & Plaider", where you can buy the yarn at the shop Fandango web shop - ternet tæppe located in Aarhus. 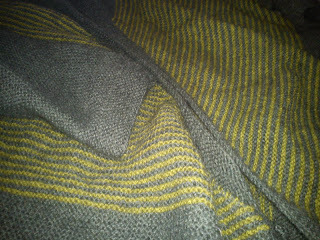 The pattern is so simple, that I am able to knit, when I sitting in front of the TV. I only have to be on the look out for the location of Hannibal the Cat, as he suddenly will jump at the moving ball of yarn biting into the wool. This fascination of a cat of yarn is something I find hard to understand !!! Sometimes I have to place the cat outside the living room, when I am knitting, as the "garden lion" can not leave the ball of yarn on it´s own, he has to chew on the yarn. 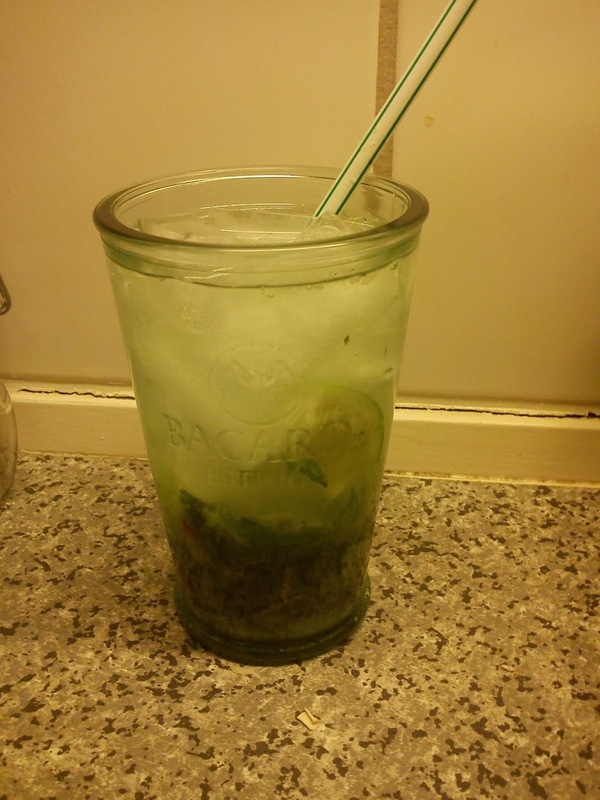 One of the big drinks in connection with New Year here in Denmark is apparently Mojito, as you buy limes fruits and mint leaves in all Danish supermarkets with respect for them shelf. So right after New Year you can buy all the leftovers of mint plants/bunches of mints and limes, as January is the month of dieting and fitness upon a calorie rich month of December full of food, alcohol and sweets. Otherwise the Mojito is more of summer cocktail for me due to it´s coolness of fresh mint leaves and plenty of ice cubes and fresh flavour notes from the mashed lime. So after I have been sweating seriously in rowing machine, I will go home and make myself a Mojito as a more funny way of getting my much needed C-vitamins !!! Adding the sugar into the lime and mint leaves, before mashing everything together is giving a better dissolution of the sugar and better sweetness in my opinion compared to added the sugar after the mashing process. 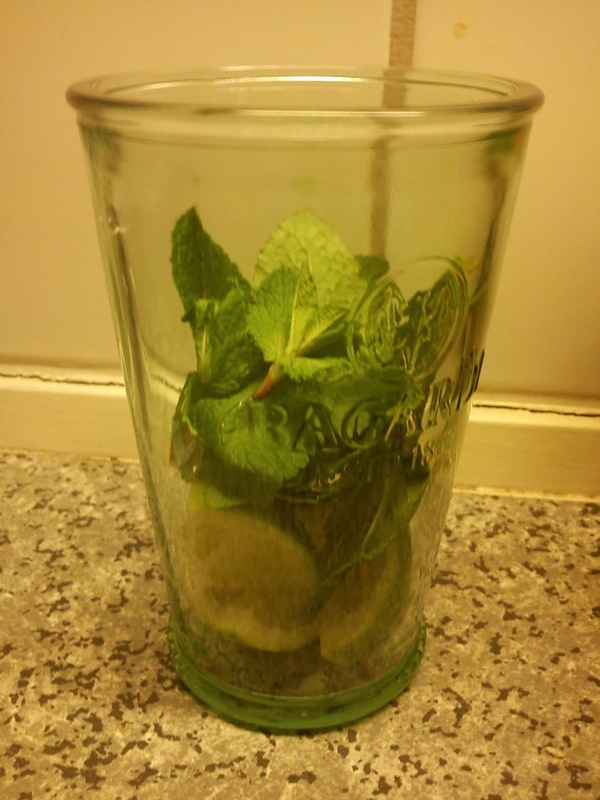 Place the lime halves, mint leaves and sugar in a high-ball glass. Mash it well together mortar. 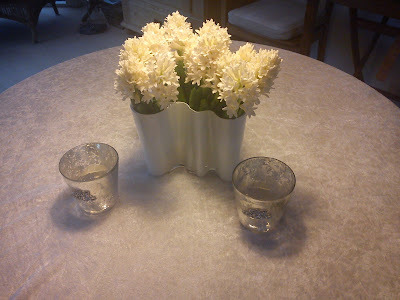 Top with sparkling water / club soda. Place a straw in the mojito. 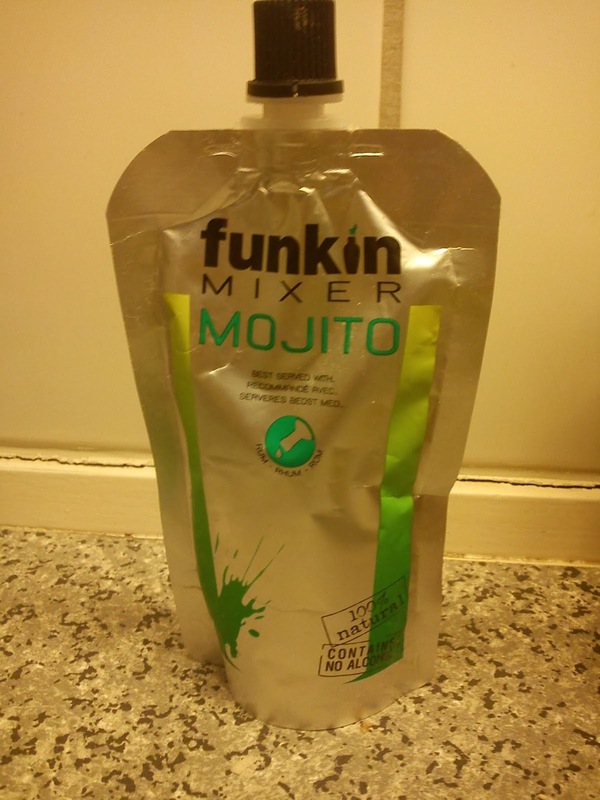 You can buy a ready-to-use Mojito mix, where you "only" need to add in the rum and ice cubes, before you have a ready-to-drink mojito such as the Funkin drink mixes. You should "only" use such a mix, if you like to drink a too sweet and too acid mojito without to much lime/mint flavour profile. 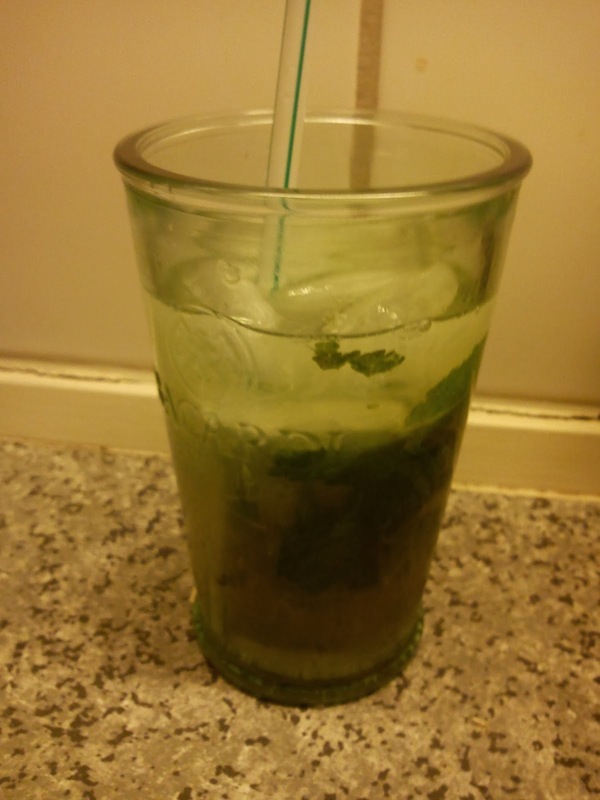 If you like to drink a less sweet and more flavourful Mojito, I will strongly recommend to make your own mojito and stay very clear of the Funkin drink mix. One Funkin drink mix cost approx 1.32 €/pack. 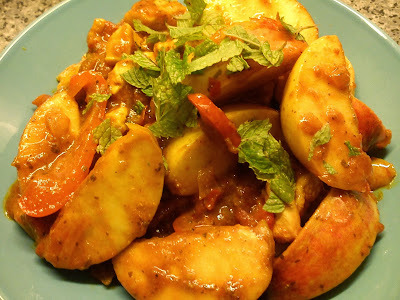 Sometimes I need to make a "clean up" in my weekly vegetable box and put "loony" vegetable into a curry dish. 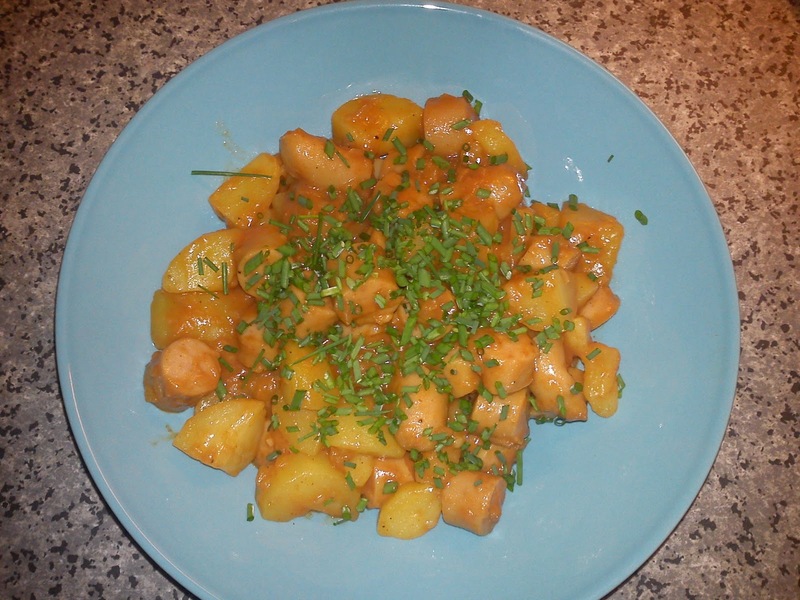 This time I used a recipe on curry with coconut and lemongrass from the weekly Årstiderne´s newsletter week 40/2013 without any major modification. Remove the chicken pieces after frying. Add some more oil to the cooking pot. Add in all the vegetable and let them fry under frequent stirring. Add in the curry paste, water and coconut cream and let everything boil up. 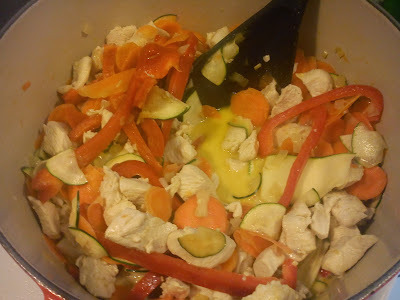 Add the chicken chunks back into the curry dish, and let them cook for another 4 minutes. Serve together with rice, which has been boiled together with the top of lemongrass. 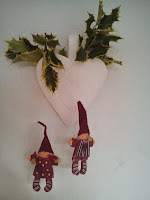 Today it is the day of Twelfth Night and tomorrow it is Epiphany. Epiphany is still a religious day here in Denmark, which has not been stopped by the Reformation in 1536 like many of the Roman Holidays. Epiphany is not a public holiday, where you will have the day off. For many families it is also the day, where all the Christmas decoration will be removed for good and packed down for the next festive season. My French colleagues have introduced my and Danish colleagues to the French cake called "Gallet des Rois", which they have been bringing back to Denmark after their return from their Christmas holiday. So then I found this recipe on a Twelfth Night cake in Country Living issue January 2014, I knew at once, that I needed to bake this cake as a final closer to the Christmas period, where I also have packed down the received Christmas cards and all the postcards of 2013. I really like to receive postcards from my friends, when they are out travelling. There is nothing better to come from work and open your mail box and find a postcard inside it :-) It is good reminder, that you have some good friends, which like and care about you. Whip the butter and sugar together using an electrical beater, until it is white and fluffy. Gradually beat in the eggs using the electrical beater. Fold in the ground almonds and rum, stirring by hand. As the commercial puff pastry is already rolled out in a thin layer, I decided to the keep the square shape. 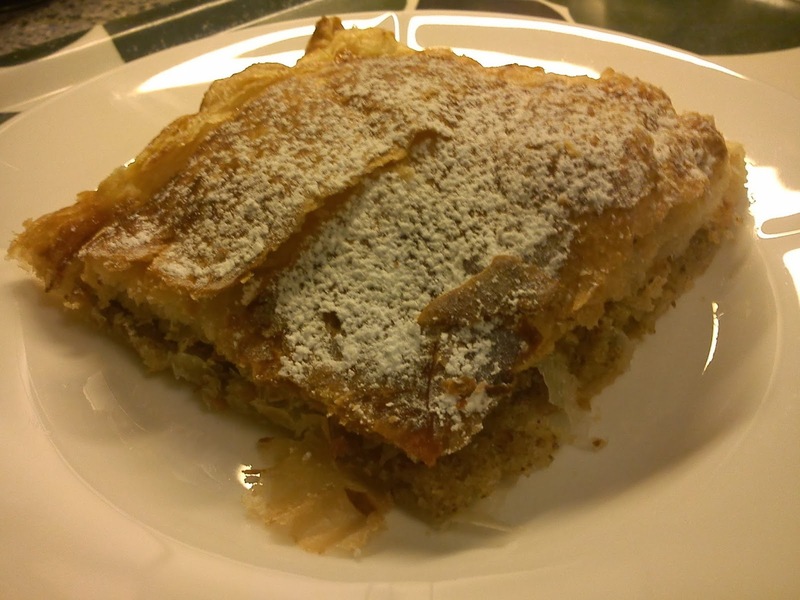 I placed one sheet of puff pastry on a baking tray covered with baking paper. Brush a border of 2.5 cm of the puff pastry with beaten egg. Place the filling in the inner part. Place the second sheet of puff pastry on top of the first puff pastry with filling. Seal the borders using the back-side of a spoon of knife. Glaze the upper layer of the puff pastry with beaten egg. Bake the Twelfth Night cake at 200'C in the upper part of the oven for 30 minutes. Cool down the cake and dust it with icing sugar. I got the inspiration for this cocktail during a business trip to France in April 2013, where I in connection with a dinner enjoyed this type of a drink as an appetiser. When I asked about the composition, I was told, that the drink contain creme de bergamot (= bergamot liqueur), cherry liqueur and sparkling wine. It took me and my French work colleagues approx 6 months, before I had a bottle of creme de bergamot in my procession !!!! First I went looking in various supermarkets in Paris on my own without any luck at all. When a good French colleague of mine went looking for creme de bergamot in other supermarkets, still without any luck. However, my colleague was when able to locate creme de bergamot through a web-based shop, so she "down-loaded" 2 bottles of creme de bergamot on my behave, as it was cheaper to buy 2 bottles instead of 1 bottle due to shipment cost. 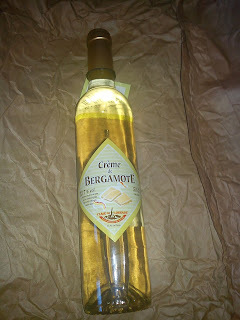 Next step was when to get the bottles of creme de bergamot transported from Paris to Denmark. This transportation step meant involvement of a second French colleague, who in connection with meeting activity in Denmark was entrusted with the transport of the creme de bergamot. 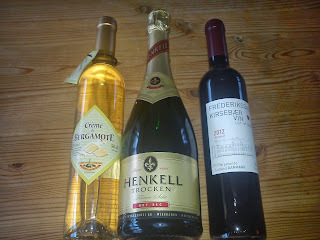 The bottles arrived safely at my work desk without being a big surprise to any of my work colleagues, as they are used to similar involvement of my colleagues, when I have my heart set on something much need, which can not be found in Denmark. My wonderful girl friends from the Christmas lunch are all sending MERCI BEAUCOUP to my French work colleagues to all their involvement in getting this creme de bergamot all the way from France to Denmark. One thing is to know, what type of ingredients is used in a drink, the next important issue is to define the ratio between these ingredients. 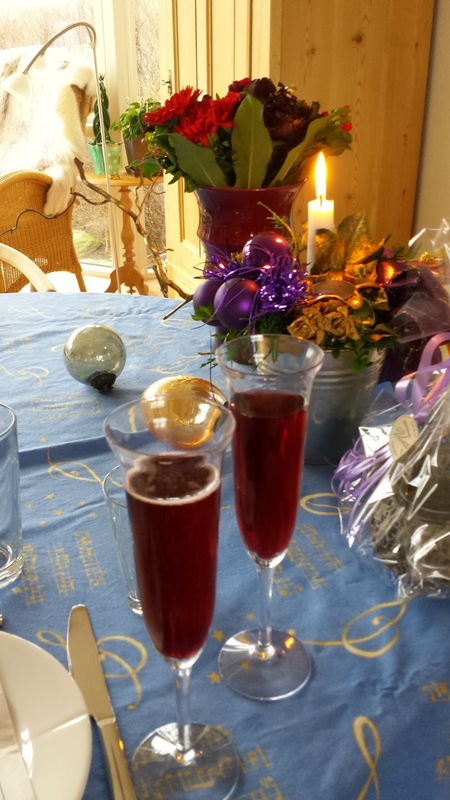 So I started off small amounts of both creme de bergamot and cherry liqueur, which was topped off with sparkling wine. When all the participant in Christmas lunch got a individual colour straw, so we all at once to taste the cocktail and discuss modification to it. We got the final composition in the third attempt. I did not need to get cherry liqueur in from France, as Denmark is having their own excellent production of cherry wine such as Frederiksdal kirsebærvin. I used a dry sparkling wine for this cocktail, I would suggest to use a semi-sweet sparkling wine instead off to get some more sweetness and fruitiness in this cocktail. I will really the flavour combination of creme de bergamot and cherry liqueur :-) A great cocktail to start off an excellent meal. Start by pouring the creme de bergamot and cherry liqueur in a champagne glass. Fill up the glass with cold sparkling wine. After a December month full of Christmas activities, living candlelight, gift, get to getter with family and friends, the reality of real life is hitting us again hard on with the arrival of January, where some people are struggling with body increase from heavy calorie intake and/or low money supply due to massive spending of money during the Christmas season (the fifth season here in Denmark) !!! The great thing about January is, that the day length here in Denmark is increasing day by day with something between 1 minutes in the beginning of the month and up to 5 minutes very single day in the end of January :-) And you can really feel it day by day at the end of the month, as the day light is increasing with ½ hour during one week !!! 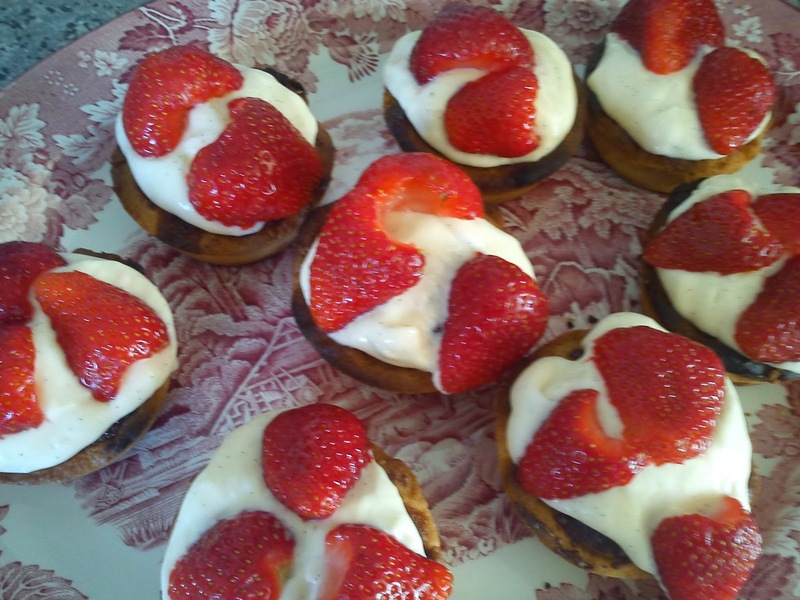 Well I will NOT be sharing any recipes on low calorie food/cakes with you during this month of calorie control. My focus be on sharing some recipes of stews and casseroles, as we all could be getting something warming during a cold Winter month. 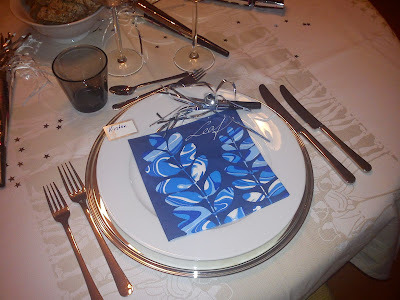 The transition from 2013 to 2014 was celebrated together with my good friends living in Horsens enjoying a 3 course "take - away" New Year´s menu from Mad hos Mads´ (nytårsmenu). 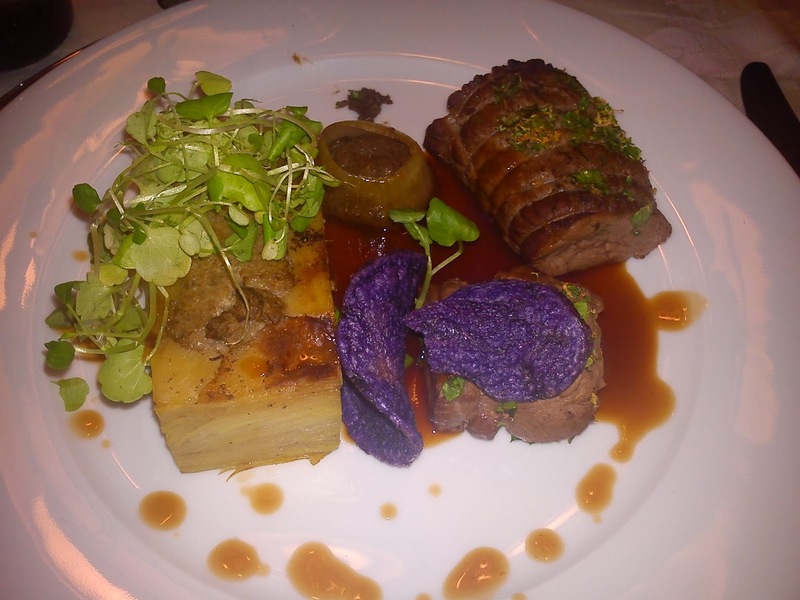 The food was very, very easy to prepare, only the appetizer and the main course required to heating up in the oven for something between 5-12 minutes. And the dessert was ready to serve without any further need for decoration !!! The New Year´s menu was started with the appetizer, which was a 3 course fish tapas dish. Ballotine of lobster and brill with herbal rind (the green lawn with a happy smiley t top of plate) together with easy smoked cod with crispy fennel salad and almonds to the left and to the right edible crab in crispy ball with aiole. 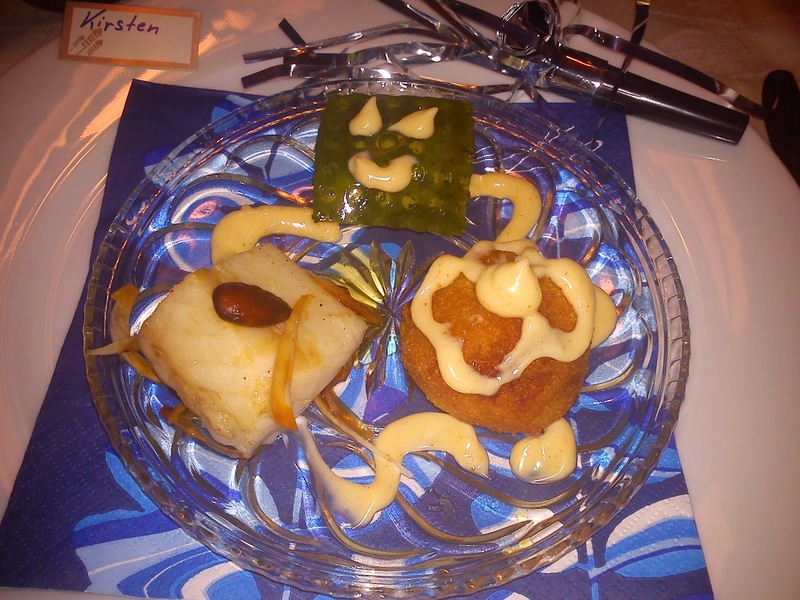 We received so mush aiole, that the entire plate became decorated with it. The lobster ballotine had a great taste and texture, so it became my favourite part of these three fish tapas. 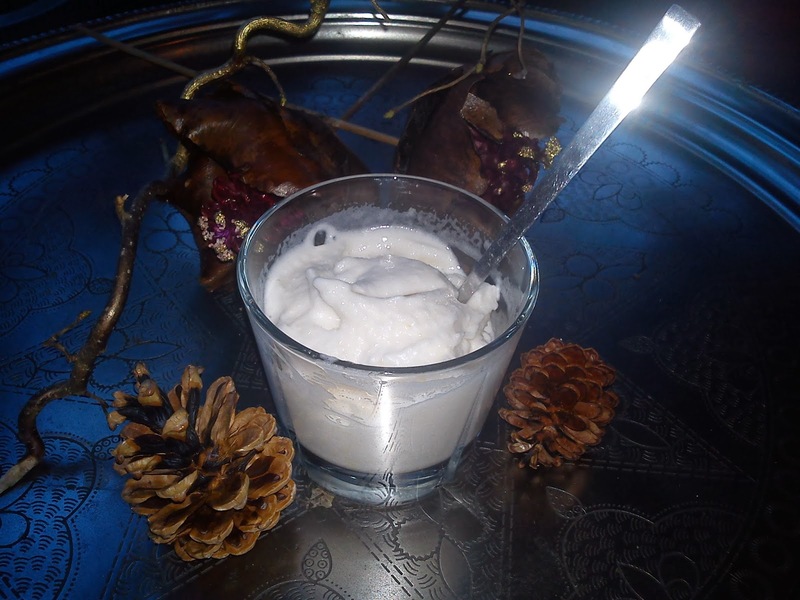 fungal cream served with a sauce from red wine and shallots. Watercress and chips of blue potatoes was the decorative element. The final touch of the excellent menu was the sweet part (dessert) in form of Chocolate Cocktail, which was made from 3 times Valrhona chocolate. 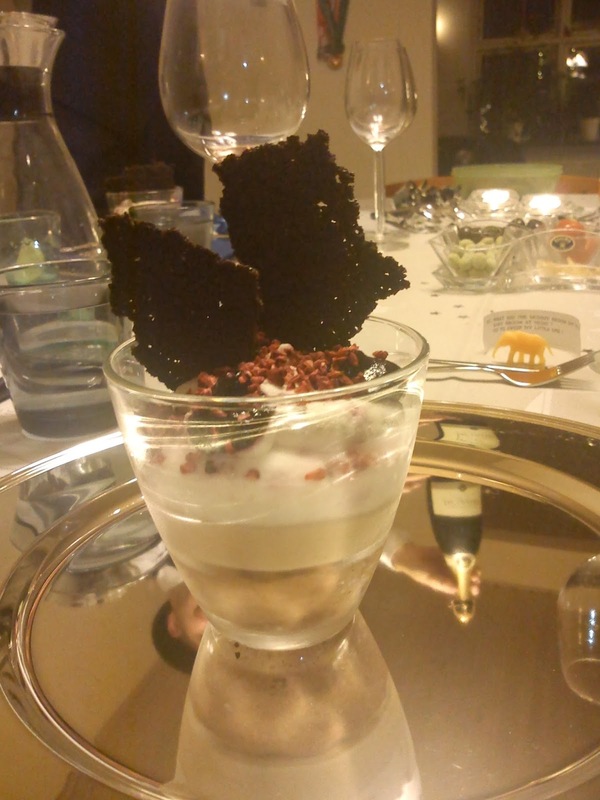 So layers of three different chocolate was served in a glass decorated with freeze-dried raspberries, so very intense blueberries pure reduction and crunchy chocolate crips bread style. In total I ended to with paying approx 39 € for the entire great tasting menu incl the almond cake for the actual transition from 2013 to 2014 excl. wine. I will give this New Year menu 6 stars. to all of you from Hannibal the Cat and I. 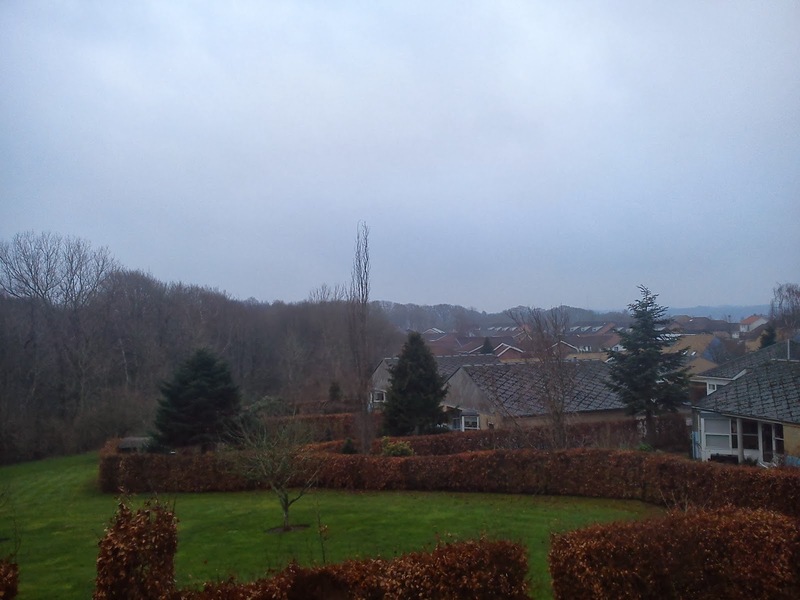 We hope you will get an exciting, promising and healthy New Year here in 2014 with plenty of sunshine, some white snow to bring some light into a dark Winter season and less wind during the rowing season !!! 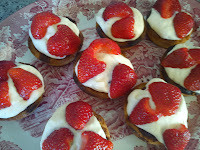 Looking into the progress of 2013 on my wish about baking my way through "Hjemmebagt", I can see, that I have baked 13 recipes in 2013 compared to 6 recipes baked in 2012 !!!! mainly during the first 6 month of 2013. If I can keep up with a speed of 13 recipes per year, I will have baked my way through this excellent bread book after another 3½ year bringing the finishing time up to sometime during 2017 with the last recipe of "Hjemmebagt". 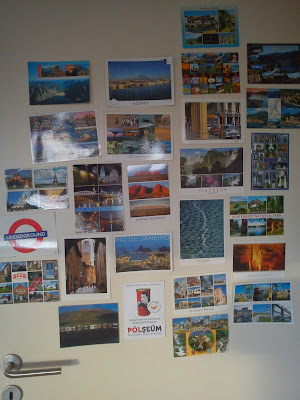 So here I have made some great progress on this specific topic, so let´s see, if I can maintain similar progress here in 2014 !!! 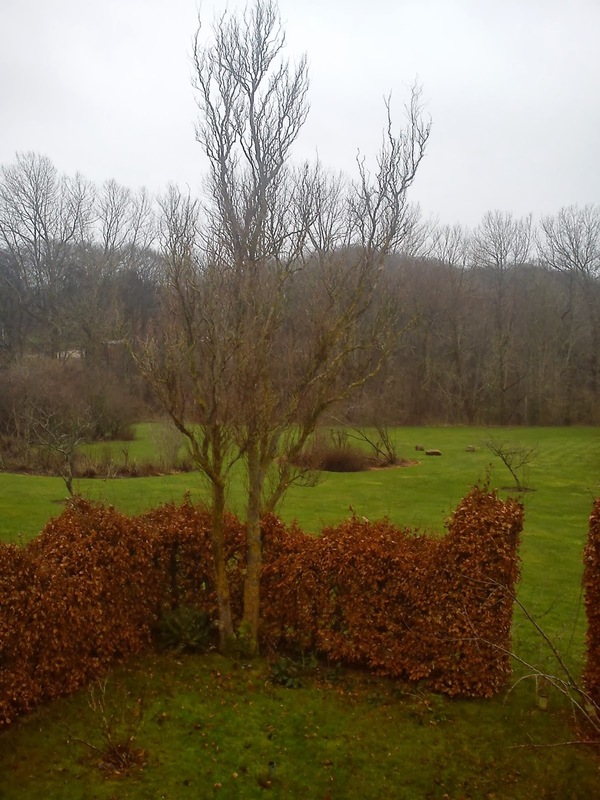 My New Year´s Resolution of 2013 concerning more usage of the seasonal herbs, flowers and fruits, which you can collect for free in nature maintain to be something of a challenge for me. I have a very good grip of using the wonderful white and fragrant elder flowers, but ramson, slow and elderberry is still unknown territory for me, but 2014 will bring me new options for getting acquainted with these Danish seasonal vegetation. Again I felt more comfortable here in 2013 about using my baking capabilities for various fund raising activities involving both work colleagues and friends turning the month of October into PINK month (PINK fund raising afternoon tea 2013 & sale of-muffin as PINK fund raising at work) collecting an amazing 1300 DKK to support the fight against breast cancer. 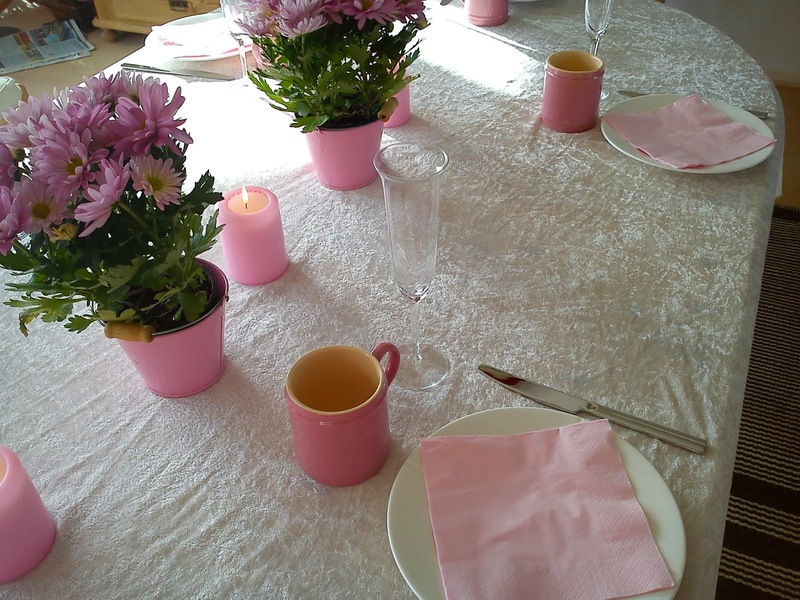 I will be back again in 2014 with some more PINK fund raising activities. 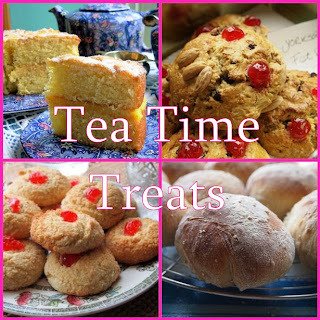 Still I am eagerly participating in the monthly virtual tea table called Tea Time Treats hosted by two food bloggers in the UK. It is great fun for me to work the various theme selected for these monthly tea tables. 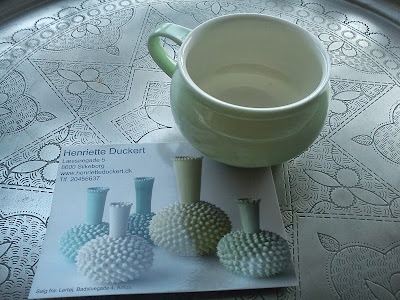 And I will continue to enjoy these monthly virtual tea tables in 2014, as it bringing me a lot of inspiration to both my and little kitchen. During Autumn I expanded my kitchen equipment assortment with two major pieces: ice cream machine with own compressor for freezing and KitchenAid in the classic red colour. Relating to the ice cream machine I am having a very ambitious plan about making a monthly ice cream, where you as my blog reader could be a part of this process through ice cream votes on my blog. So fare I have been conducting one ice cream election, where you selected vanilla ice cream as your first choice, and I created two versions of this vanilla ice cream: home-made vanilla ice cream a la "A Country Cook´s Kitchen" and ultra indulgent vanilla ice cream artisan style. 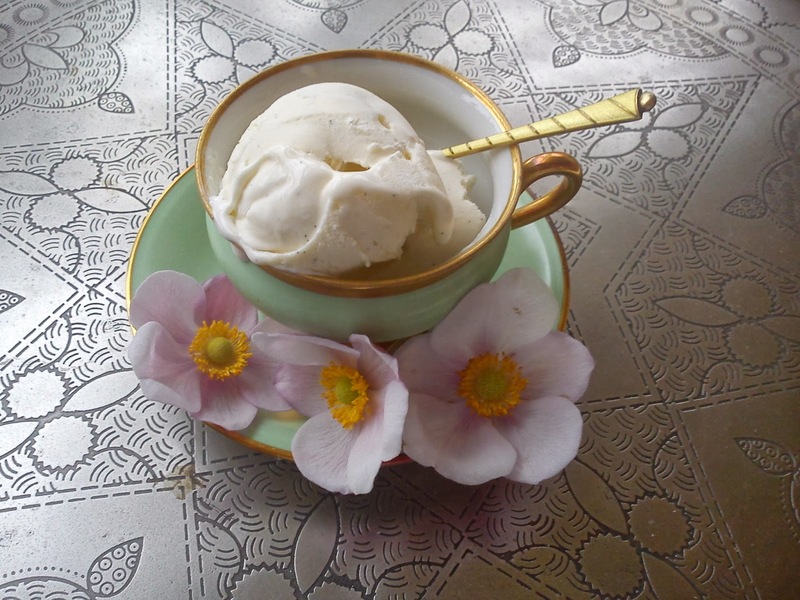 And here in December I created the Christmas ice cream, which was very fitting into my annual Christmas Calender.